With a country that’s perhaps as politically aware as any time in recent history, this year’s President’s Day has a heightened level of exposure. Award-winning, Miami, Florida-based Chef Adrianne Calvo has decided to infuse her trademark Maximum Flavor into the occasion by putting her own delicious twist on a 123-year-old recipe straight from the White House Cookbook! 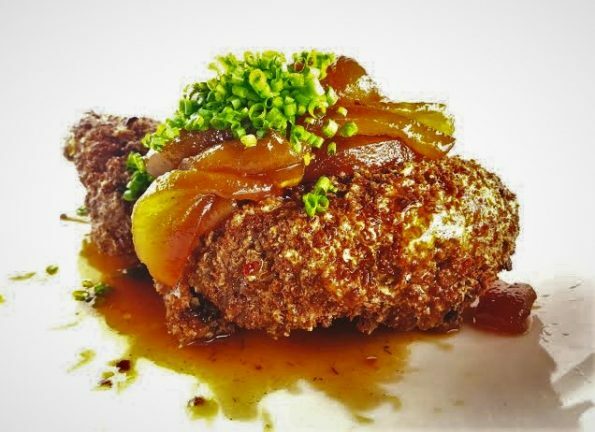 The original dish, Pork Chop and Fried Apples, has been reinvented as Chef Adrianne’s Presidents Day Crispy Panko-Crusted Pork Chop and Spicy Caramel Apples, bringing an American classic into the present day. Chef Adrianne’s Vineyard Restaurant and Wine Bar opened in 2007 and offers a varied and rotating menu with something for everyone. Monthly, the restaurant holds its signature event, Dark Dining, where guests are blindfolded for a sensual experience eliminating one sense in order to enhance another, providing maximum flavor. For more information, visit www.chefadriannes.com or follow her on Instagram: @chefadrianne and Facebook by clicking here. Preheat fryer to 375 degrees F.
On a work surface, season pork chops with garlic salt and black pepper. Take three mixing bowls and place flour in one, beaten eggs in the second one, and panko in the third. Dredge seasoned pork chop in flour and dust off to shake excess. Then, dip into eggs and immediately into panko bread crumbs. Place into fryer and cook for 10-12 minutes or until golden brown and cooked through. Meanwhile, in a saucepan, add butter, brown sugar, and apples - cook over medium high heat. Sprinkle with salt to taste. Add pepper flakes and cinnamon stick. Stir and cook for 10 minutes or until caramel starts to form. Add rum and cook for another minute. To plate, place pork chop on in center of dish and top with spicy caramel apples.